This year marks the third annual post from this Blog highlighting EPA’s enforcement and compliance figures. And while this year’s data tells a number of interesting stories, no story is larger than the potential impact of the incoming Trump Administration on EPA’s enforcement figures in 2017. With that as our backdrop—and fully admitting that this time next year, EPA’s data may look very different giving us even more to talk about—here are just some of the interesting facts and trends spotted in last year's data. Posted on January 24, 2017 by Mat Todaro and tagged EPA Enforcement Maine Rhode Island. As it does each year, the U.S. Environmental Protection Agency (the “EPA” or “Agency”) recently released its annual enforcement statistics for the past year. As the Agency has been saying throughout Administrator McCarthy’s tenure, it is focusing on high visibility enforcement with greater environmental (and financial) bang for its buck. The data is living proof—fewer actions, but larger penalty figures. And as has been highlighted on this Blog in the past, EPA’s year-end enforcement website is a treasure-trove of information. Statistics are broken down by region, state, and statute, making it even more useful. For those of us in Region 1, it’s interesting to note that the Agency initiated just 104 cases in the past year; the lowest number in the country. Contrast that with Region 6 which topped the list by initiating 362 enforcement cases in 2015. 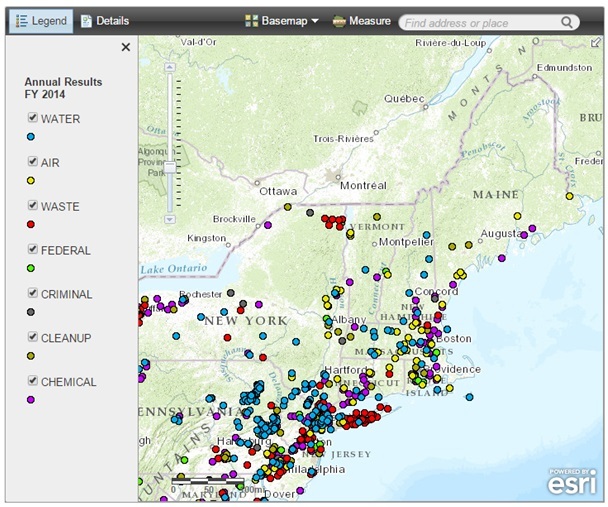 My personal favorite is the interactive “Case Map” because large enforcement trends are easy to spot. For example, within Region 1, Connecticut was the only state where enforcement actions increased (24 in 2014 v. 32 in 2015). It also seems as if the large majority of water violations across the country are clustered in the northeast corridor and the majority of air violations occur in the upper Midwest states with heavy concentrations around Chicago and Detroit. Since everyone loves a table, here is a data compilation for four New England states, complete with a handy juxtaposition against 2014 data. Enjoy the numbers and check back again next year for new trends and a hearty three-year comparison! Click here to download a PDF of the table below. Posted on January 25, 2016 by Mat Todaro and tagged EPA Enforcement Maine Rhode Island.